For easy dipping and eating, cut cucumbers into wedges. If you serve English cucumbers, there is no need to peel them first. Cut the cucumber in half across its diameter and slice each half length-wise into quarters or thirds, depending on the circumference of the cucumber. If the seeds are very large or watery, scoop them out with a spoon before slicing into spears. The vegetables can also simply be cut into thin slices in various thicknesses and the ends discarded. 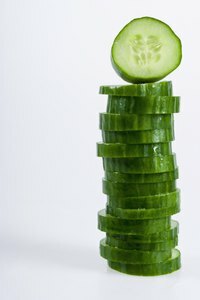 To dress up cucumber rounds, run the tines of a fork down all the peeled sides to score the flesh before cutting to create a pattern on the surface of the slices. For whimsical cucumber balls, use a melon baller to scoop out balls and garnish each with a sprig or two of fresh chive. To give the balls volume, leave the seeds intact. Cut unpeeled cucumbers into 1/4- to 1/2-inch-thick slices. Use miniature cookie cutters to cut the centers of the slices into various shapes such as stars, flowers cloverleafs and diamonds. To make cucumber baskets, cut each slice with a waffle-pattern garnishing tool that makes the flesh in each round look like woven bamboo, and attach the rounds together with toothpicks to make an edible basket to hold other vegetables. The sturdiness of cucumbers makes them good garnishes. Use a vegetable peeler to cut long, thin strips down the sides of whole, unpeeled cucumbers. Soak the ribbons in ice water and arrange them in flowing patterns to garnish salads and crudites trays, or put them in stemmed cocktail glasses and hold the sculpted creations in place with cocktail toothpicks. Slice peeled cucumbers very thinly and make one cut from the center of each round to the outside of the disc. Twist each side in opposite direction to create a delicate, three-dimensional garnish. Overlap cucumber slices like flower petals on a plate and serve a colorful salad in the center of the display. To hold small hors d’oeuvres or make umbrella garnishes for drinks, cut off the ends of unpeeled cucumbers and carefully hollow them out, leaving only the green skin behind. Purchase the biggest, most uniformly shaped cucumber available and transform it into a food sculpture. Turn it into an exotic bird or a biplane with long, thin carrot planks for wings, attached to each side with toothpicks; use cherry tomatoes, jumbo black olives or other carved vegetables for the bird’s head or the pilot in the cockpit. Hollow out the top of the cucumber and fill it with dip for other vegetables.